Carnie Wilson gave birth to a little girl last Friday, at Cedars-Sinai Medical Center. Named Luciana Bella, the healthy baby weighed in at 6 pounds, 5 ounces and measured 19 inches in length. This is the second child for the Wilson Phillips singer; she and musician husband Rob Bonfiglio also have a 4-year-old daughter named Lola Sofia. I totally love the names! 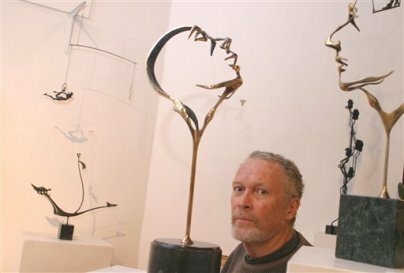 And now the sad news…..
Patrick Farrow, 66, sculptor and brother of actress Mia Farrow, was found dead in his art gallery late Monday when emergency workers were called to the Farrow Gallery after receiving a call from an unidentified woman asking for help. The caller might have been Patrick’s wife, Susan Farrow. A professional sculptor for over 35 years, Patrick Farrow and his wife Susan owned and operated the Farrow Gallery located in Castleton – a small town near the New York border – where they sold art and jewelry. Police are calling Patrick Farrow’s death “suspicious” and an autopsy will be conducted. Lt. Timothy Oliver called Farrow’s death suspicious in a written statement made on Tuesday. Oliver, who didn’t respond to telephone calls on the case, told WPTZ-TV that police don’t suspect foul play, but he said there were some things out of the ordinary at the scene but did not elaborate. next post: Was David Carradine Killed By Transsexual Prostitutes? 53 queries in 1.374 seconds.